In Wyoming last Monday morning I stood amongst sweet-smelling sagebrush on a high promontory and watched the sun totally get its hiney handed to it. The moon just floated up in there at exactly the right angle and, shoomp, the world around me became dark, cool and so quiet you could almost hear my friend Bob refilling his cup from the boxed wine. I am joking, of course. There was whooping. Near-religious spectacles call for whooping. I filmed myself, just in case I wept, which I hear people do at a total eclipse, or fell to my knees, or was converted on the spot to the Republican party. It turns out that in the face of once-in-a-lifetime, awe-inspiring views, I tend to look like I am watching a really high altitude documentary about adjustable rate mortgages. I did choke up a bit, then became aware I was choking up, then thought “why are you choking up?” Right there is the history of my people. Apparently, any given spot on Earth will have a total solar eclipse every 350 years or so. 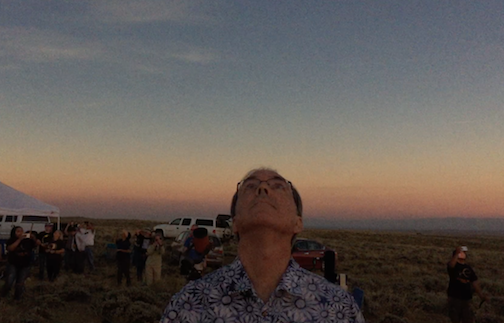 Not patient enough for that kind of wait, my other friend Greg is an eclipse chaser. This was his fifth. A professor of physics, he brought two big telescopes and filmed the thing. In contrast, the other two dozen of us mostly sat in camp chairs drinking Arnold Palmers and munching banana bread. Each of us channels his inner scientist in his own way. I will never forget the perfect black sphere of the moon silhouetted by the wispy white corona of the sun, but mainly I will remember the way the dark fell. In a span of five seconds day became night, and the primal fear which each of us has inside, going all the way back, was triggered and just as quickly countered. Some whooped, some wowed, some sat slack-jawed, but all, I am sure, felt the same thing—we are tiny. We…are…tiny. I wanted to get home, everybody did, but if she had just flipped the sign around, revealing the words, “See you in 350 years,” I would have been her first customer. Fabulous column George! I'm looking forward to another in 350 years. Almost had a mini Woodstock flair to it. Thanks for your talent with words. I really enjoyed this column.